Homemade Vegan Pantry - best vegan cookbook reviews Vegans Eat What? 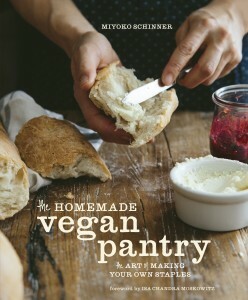 Help support VegansEatWhat.com – order this book via our Amazon link! I love this book. Full disclosure, I’ve loved Miyoko ever since she produced the “Unturkey” under her now defunct “Now and Zen” label years ago. We used to pack the frozen version of this in our luggage, fly to family, and later cook this as part of the Thanksgiving feast. We often featured this for other holidays as well. This is not a book for everyone. For those who have no interest in being in the kitchen longer than 15 minutes, this is probably not your book (but there are a few exceptions to this). But for those who aren’t afraid to spend some quality time in the kitchen, you will adore this book! Whether you aspire to make your own soy milk, tofu, tempeh (yes, even tempeh!) or simply your own ketchup and mustard, you will love this book. Miyoko offers endless options so I know that when I want to make a certain recipe from her book I can make it “totally” from scratch (she includes all the recipes), or “somewhat” from scratch. I can buy my favorite vegan mayo, for instance, or substitute my favorite powdered veggie broth for homemade. As of this writing, we have tried 3 different ketchups (Regular, Maple Balsamic, and Smoky), 2 different mustards (Dijon with Chardonnay and Dark Ale), the See-Food Chowder and crab cakes. All of the condiments were a great success and loved by our taste-testing friends who received them as holiday presents. We enjoyed the other recipes as well and are looking forward to trying many more from this wonderful book. Enjoy the very yummy See-Food Chowder below! Preheat oven to 425 F degrees. Cut or tear mushrooms into bite size pieces. Sprinkle with olive oil and season with salt and pepper. Spread onto baking sheets in one layer. Roast until brown and tender, about 20 minutes. Meanwhile, in a heavy pot over medium heat, sauté onion in water until soft. Add the potatoes, carrots, bell pepper, stock, garlic and wakame powder and simmer until tender, about 20 minutes. Place cashews and water in a blender and process until smooth. Add the mushrooms to the broth mixture and add cashew cream to make as creamy as you like. Season with salt and pepper. Sprinkle with parsley. Serve with chunky bread. This chowder will keep in the fridge for 3-4 days. Makes 6 servings. Heat the oil in a stock pot over medium heat. Add the vegetables and garlic and sauté for several minutes to wilt. Add the water, wine, kombu, salt and peppercorns. Bring to a boil, turn down heat and simmer for about 45 minutes. Add the dulse and simmer for another minutes, then remove from heat. Let it set for 15 minutes, then strain through a sieve. Store in an airtight container in the fridge for 3-4 days or in the freezer for up to 6 months. Note: I generally saute in veggie broth, water or wine instead or oil and did so in testing these recipe as well.